How to choose and install a safe for the house? Home safe – this is not a whim or a luxury, but a sure way to save not only money, but other small but expensive items. For example, jewelry and valuables, securities, as well as strong medicines or toxic substances. It is a guarantee that the random attackers, once inside your apartment, can be very disappointed. But to choose and install a high-tech device to properly. Choose a safe should be based on their needs. Safes are classified into tamper-proof, flame retardant, and combined protecting against burglary and fire, they are the most expensive. Burglar-proof safes, according to the Russian standards, can be divided into 12 classes – levels of protection. The higher the class, the safe, more reliable and, consequently, more expensive. For household use provides safety Deposit boxes not higher of class III protection. This class is determined not only by the type and complexity of the castle, which may have reliability And or but and thickness. Safe with the reliability class I shall have a thickness not less than 3 mm and be fitted with a lock in class A. Still have newsamerica safe design, class which is defined as 0 or D0. Rather, they are designed to protect against children's curiosity. A good and reliable the safe should be equipped with a lock with anti-sawing. Safes differ in method of installation. Recessed mounted in wall and are fixed with cement and anchor bolts. Usually only the front panel has a strong protection from all other sides they are protected by impenetrable walls. Masking is carried out with the help of pictures, mirrors or wall panels. If the robbers tried to drag a safe out of the wall – the noise will be very much. Furniture safes can be installed wherever you want. They are small in size and can be hidden anywhere, like in a closet or Cabinet. There are models that can be clipped with the help of a reliable anchor bolts using the wall or floor. This complicates the task of the raiders, especially considering that the weight of the safe may be large enough. 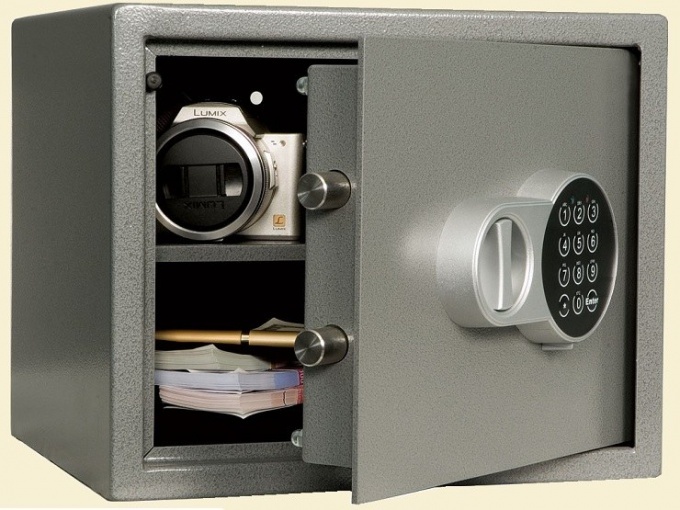 Safes are equipped with key, mechanical combination and electronic locks. Key locks are the most popular. Mechanical may or may not have the ability to change code, e-code must be periodically replaced. To ensure trouble-free operation of the electronic lock box, shall be provided with Autonomous power supply. To install a recessed box for him must be hollow, and can, still under construction to provide a special niche. The main body of the box shall be welded fittings or hinges, which are filled after installation with cement mortar in the space between the walls of the safe alcove. Making additional loops or holes for mounting the safe, proceed carefully in order not to compromise its fire resistance. For the installation of safe furniture design required anchor bolts, they must be particularly robust, since even a simple scrap provides the breaking force of the force in ton. Usually the mounting holes are on the rear or bottom wall of the safe, if not, drill them yourself. To install anchor, drill in the floor or a hole in the wall and insert the sleeve, when the bolt will twist the petals on the sleeve diverge and raskinetsya inside the hole, providing a secure fit.